The checkout area is where the customer selects their preferred method of shipping and confirms their order by instructing you to take payment. As your customer is not actually committed to making their purchase until they’ve actually handed over their money, you need to do all you can to safely guide them home by swiftly and efficiently taking their payment details and confirming their order. And that fundamentally means reducing the chances of users abandoning their shopping cart by removing all screen clutter that can distract the customer and minimising the number of steps that they have to take to complete their purchase. In order to make a purchase, the customer will need to provide you with details of payment and delivery, such as name, postal address, credit card details and contact numbers. For returning customers, having to enter this information every single time they purchase can become incredibly tiresome. It is an unnecessary inconvenience that could make the difference between making a sale and losing that customer. So when a new visitor purchases an item from your eCommerce site, you should allow them to register, so that you can store their full details in a secure database for later use. This means that, in future, the customer only need enter a user ID and password and the system will handle the rest. Ideally the user ID should be the customer’s email address instead of a conventional username. This is because users often forget the username they created at the time of registration, but few forget their email address. Secondly, every email address is unique, so your eCommerce system avoids the problem of customers choosing the same user ID. Another good reason for collecting customer information is that it creates a marketing database, allowing you to inform customers of special offers and new products or services. However, you should always seek consent from the user to send them emails or SMS messages in the future – usually by means of an opt-in check box as part of your data protection notice. Customer registration clearly improves the shopping experience by speeding up the buying process for returning customers. Therefore, in many cases, it may make sense to make registration compulsory. However, the downside to compulsory registration is that you introduce an extra unnecessary step into the ordering process. This can put off many casual buyers, who will then abandon their cart and shop elsewhere. So you will need to weigh up the pros and cons of compulsory registration. If you think that a large proportion of your customers are likely to make just one-off purchases, then you should go for optional registration and allow visitors to purchase from your site as guests. If, on the other hand, you decide to make registration compulsory, make sure you still allow guests to shop on your site first. 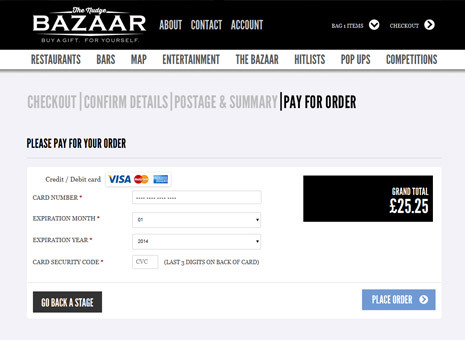 Some eCommerce sites make users sign up for a customer account before they can even start adding items to the basket. However, you should avoid doing this as many first-time visitors to your site simply won’t even bother to go any further. Instead you should allow new customers to shop first, but make them sign up as part of the checkout procedure. This is because you’ll minimise the extra effort in registering, as the extra information the visitor would need to submit would be little more than what a guest customer would enter anyway.